Argentina's President Mauricio Macri (2nd R) speaks as he visits the construction site, Jan. 14, 2019. Argentina's President Mauricio Macri on Monday said a joint Argentina-China hydropower megaproject is "highly important" and "emblematic" in terms of renewable energy and economic development. 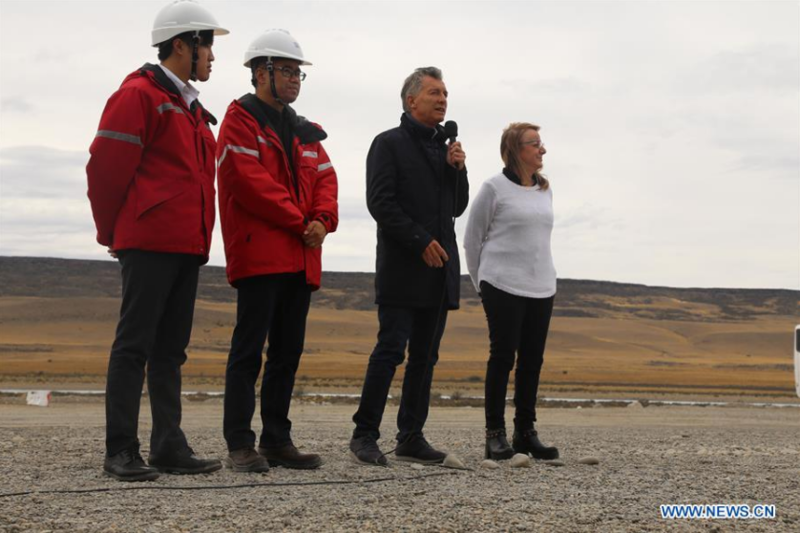 Macri made the remarks during his first official visit to the construction site of the project, where two hydroelectric dams, Condor Cliff and La Barrancosa, are being erected along the Santa Cruz River in southern Argentina to boost national energy output. "I am pleased to be here right now because these dams represent a lot to Santa Cruz. It is a highly important emblematic project, and I think it is a relief to all residents of Santa Cruz to see the companies pick up momentum," said Macri. When the dams are completed, the South American country will be able to generate an additional 4.95 billion kilowatt hours (kWh) in energy, reducing its reliance on fossil fuels and improving its energy structure. Annual savings in imported fuel will reach 1.1 billion U.S. dollars, according to Gezhouba's estimates. "Chinese investment in infrastructure in Argentina offers a great opportunity to complement our economies," said economist Gonzalo Tordini, who teaches at the National University of Quilmes in southern Buenos Aires. The dams represent Argentina's third largest hydroelectric complex after Yacyreta and Salto Grande, he noted, and will make Santa Cruz the country's second largest producer of electric energy. "Argentina has found in China a great partner to carry out this project that Santa Cruz's leaders have dreamed of since the 1950s. The Santa Cruz River is one of the country's biggest, that's why the dams that are under construction will help achieve a longed for dream of Argentina's Patagonia, which will benefit the whole country," said the expert.